This was the title of an invited talk I gave at MongoDB’s first public event in Germany on September 26th. MongoDB is awesome in that it is able to handle large amounts of both structured (read: relational sources) and unstructured (read: NoSQL) data. 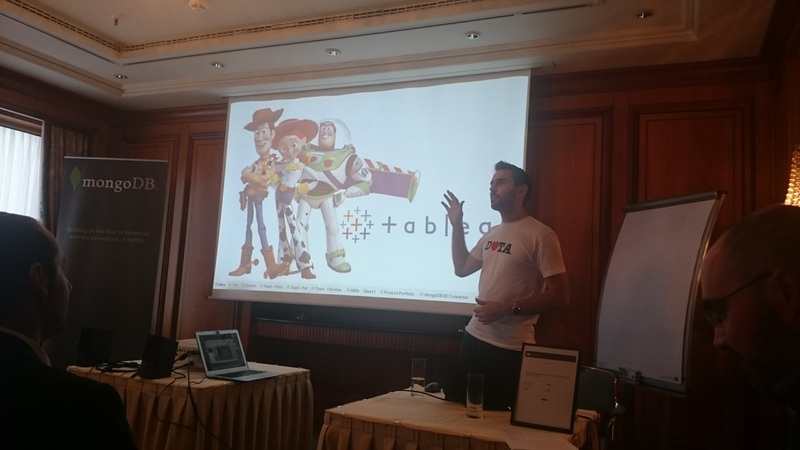 Also, the ability to integrate data from a number of disparate sources and the fast response times make it a good fit to be used together with Tableau for any kind of ad-hoc analysis task. In order to show these capabilities and also to have some fun I decided to spice up the introduction of Tableau I provided there with a little live demo of how this looks in real life. When it came to select what data to use I decided to go with movie data – a logical choice since we have the Tableau Cinema Tour coming up soon (see below). Also, one of our founding fathers here at Tableau is Prof. Pat Hanrahan, who received his first Academy Award (of three!) for the development of the RenderMan® Software that only made movies like Toy Story possible in the first place. The data is a direct dump of the Internet Movie Database (IMDb), which anybody can obtain for free. It was a LOT of work to get the data into a format that was consumable by any analytical tool – regex for the win! That said, the data is amazing! As I mentioned above, the Tableau Cinema Tour is about to kick off on October 5th. This means you will be able to go to your favorite movie theater and learn about Tableau and visual data analysis on what are probably the biggest screens Tableau has ever been shown on. All that while munching away delicious popcorn and learning a lot about movies, TV shows and so much more. Make sure to check our event webpage and register before it’s too late. The events are absolutely for free and will be conducted in German in eight cities across Germany, Austria, and Switzerland. I hope to see you there!